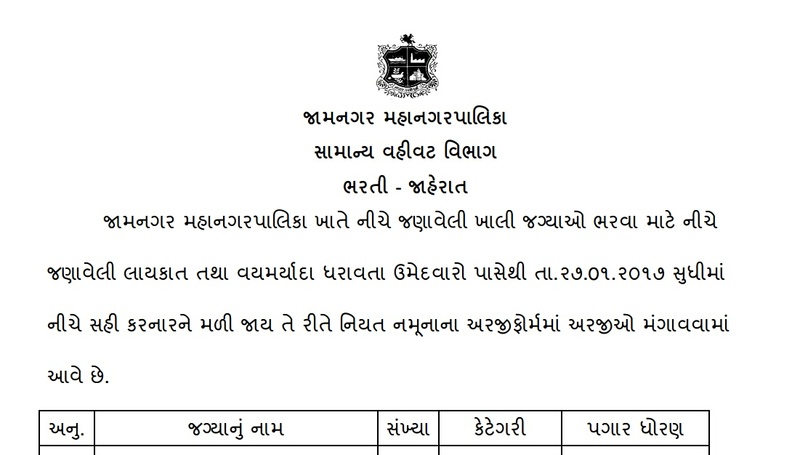 Jamnagar Municipal Corporation (JMC) Published Recruitment For Various Posts. .The candidates can apply for the desired post in the prescribed format on or before 27-01-2017.Candidate is advised to visit official JMC Recruitment notification before applying for this post.more detailed information regarding educational qualification,age limit,selection procedure,how to apply ,last date for Jamnagar Municipal Corporation (JMC) Recruitment 2017 are mentioned below. How to Apply JMC Recruitment 2017 ? Interested & eligible candidate can send their application at the following address on or before 27-01-2017.